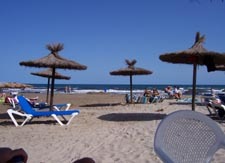 Beaches of Playa Flamenca including Cala Penas, Cala Mosca and Cala Estaca. 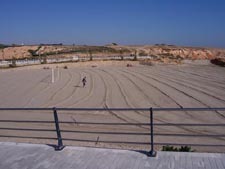 It appears that there are three beaches, which are loosely referred to as Playa Flamenca. 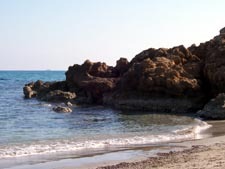 They are Cala Peñas, Cala Mosca and Cala Estaca. 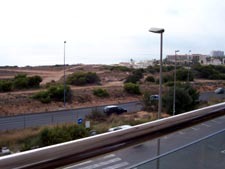 When you stand in front of the line of shops, cafes and bars with the new promenade spreading in front of you, you have Cala Mosca on your left and Cala Peñas is the next along northwards towards Punta Prima. Cala Estaca is round the headland on your right. 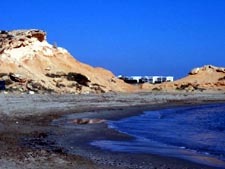 Cala Peñas can be reached either by walking on the sand from Cala Mosca or from the cliff above. 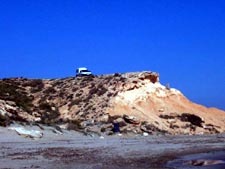 You can get here either from the edge of Cala Mosca or from the N332 across the rough ground. This is a small beach with no facilities, but very peaceful and beautiful. See for your self in these lovely photos taken by my sister – some of them in January ! 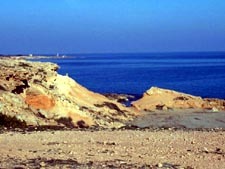 Above are some photos of Cala Peñas. 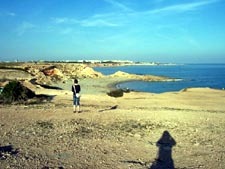 Next along is Cala Mosca or Cala La Mosca. This has the lovely new promenade surrounding it, with seats and lampposts. 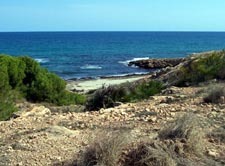 The promenade starts at the north corner of Cala Mosca. There are 3 water stands on this beach – there are toilets and showers in summer also parasols and sun beds and a snack bar. The beach is graded each morning by tractor so it is always clean. I think you can see some of this in the photos. 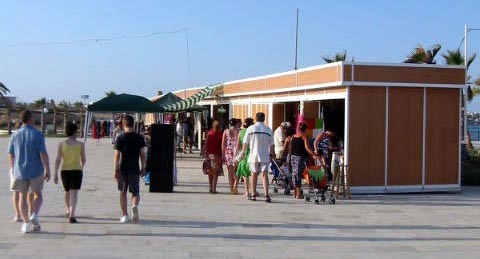 There are shops, cafes and a bar along the landward side of the promenade and up the roads on both sides. 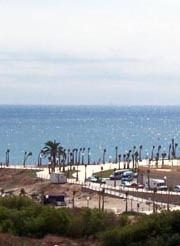 The promenade has a concave curve round the back of Cala Mosca and then takes a convex curve round the coastline and the rocky headland. Here there is a large open space with a sundial and palm trees. I understand there is keep fit in this space – is it Tuesday mornings? A Summer Arts and Crafts market is also held here - July and August, 7pm to 1am. When we were here in July 2008 not all the stands were taken but the things for sale were good and different from the usual markets. 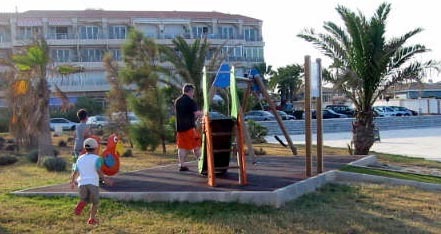 There is also a small playground here. The prom curves concave again round the next bay. 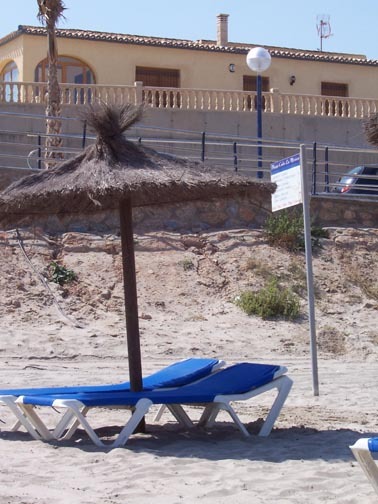 This beach is Cala Estaca, which is named as Playa Flamenca on the beach sign but appears on maps as Cala Estaca. This is a lovely large beach with 3 water stands, which will be showers and toilets in the summer. At that time there is also a snack bar and a volleyball net. This beach is also graded daily. In the photos below, which were taken in May, you can see the snack bar, the toilet block and the volleyball net. 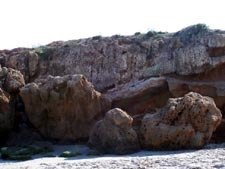 If you follow the bridge over the gully (barranca) and rejoin the prom going uphill along the side of the beach, you will come to Calle Las Margaritas and the Playa Flamenca snack bar. This is really a café bar and beautifully placed. So no shortage of watering holes around here. 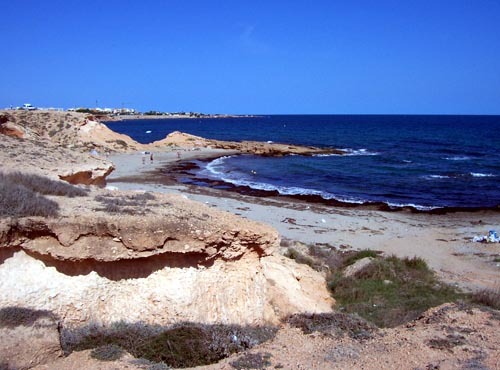 You can continue round the coastal walk, first to La Zenia and then to Cabo Roig.